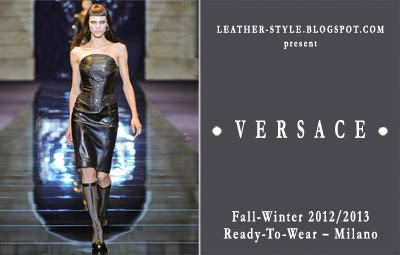 Strapless and corseted leather dresses with cristals, crosses prints and metal, skirts above-the-knee with cross applications, mesh leather boots with zip rear - designer Donatella Versace presents in Milan fashion week an impressive and memorable collection that is well-known rebellious aristocratic style of the brand Versace. Asian Model Tao Okamoto in leather & thigh high boots photographed by Daniel Jackson for Vogue Nippon, November 2009. Editorial called "Hard to impress"... 8 HD images. 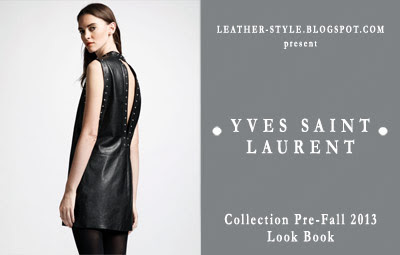 Delicacy, pastel colors and classic style of Yves Saint Laurent Pre-Fall 2013 Collection. Leather pants are skinny, low waist, following closely the curves of the legs. Dresses are short, sleeveless, elegant combination of leather, lace and chiffon. Brazilian fashion brand Denuncia (since 1995) presents its collection for Fall-Winter 2013 with an exciting photoshoot of the famous Brazilian singer Claudia Leitte. Denuncia style includes prints, embroidery, decoration and a great diversity of colors. Accent of the collection is put on the jeans, but for this ad campaign glossy leathern shine is not missed. Claudia Leitte in leather & leatherette apparel plays the perfect mannequin in Denuncia Fall-Winter 2013 advertising campaign. PVC (vinyl), patent leather, neoprene (amazing! ), latex, platforms and extremely high-heels in a extravagant look, typical of Nicola Formichetti. True to modernistic Mugler's style (to make one's first appearance as designer of this brand) stylist of Lady Gaga fascinate with creative manipulate the materials, colors and shapes.